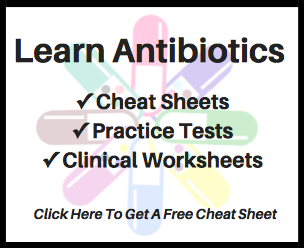 This text and table is intended for use as a study tool to assist people learning antimicrobial pharmacotherapy of oritavancin and dalbavancin. Perspective on their potential roles in clinical practice and additional resources are also provided. You can see how well you know these two drugs with this quick 5-question quiz here. Dalbavancin (Dalvance) and oritavancin (Orbactiv) are antibiotics with long half-lives which allow for extraordinarily infrequent dosing. Both drugs were FDA- approved in 2014 for acute bacterial skin and skin structure infections, providing novel options for infections caused by resistant Gram positive organisms such as methicillin-resistant Staphylococcus aureus (MRSA). The role of dalbavancin and oritavancin in clinical practice continues to evolve. For one, their hefty price tag has caused many clinicians to think twice before pulling the trigger on prescribing them. In addition, clinical data for indications beyond the FDA-approvals continues to trickle in, suggesting broader future application. These drugs are relatively new to the market and not as widely used as some of our other antibiotics. It is likely that people are still trying to learn about their nuances and there is no doubt trainees will be looking to get a handle on some of the basics. In an effort to assist with this process, we have composed the following study table to help compare dalbavancin versus oritavancin. The information in this comparison includes some of the most common considerations to be aware of in clinical practice. Readers are cautioned that: (1) this is not a complete review of these two agents, (2) some of what is presented is based upon the opinion of the authors, and (3) this is not a replacement for sound clinical judgment. This is provided for study purposes only. Red man syndrome aka “red person syndrome” aka “red neck syndrome” results from infusing certain types of medications too rapidly, which causes the body to release histamine and in turn causes the skin to turn red. Red man syndrome is not an allergy, but drugs that cause red man syndrome can also cause hypersensitivity reactions. Typically when people talk about red man syndrome, they are talking about vancomycin, but other drugs besides vancomycin (e.g., ortivancin, dalbavancin) can cause red man syndrome too. It is common that red man syndrome can be managed with antihistamines and slowing infusion rates.